UQ‐Ochsner Clinical School’s Dr Yvens Laborde loves a good quote, but it’s one by Irish playwright George Bernard Shaw that he really takes to heart. Shaw’s famous commentary on the nature of being human is a concept that Dr Larbode is teaching to UQ‐Ochsner Clinical School students first‐hand as they accompany him on medical rotations in the tiny Caribbean nation of Haiti. Frequently beset by hurricanes, Haiti straddles a tectonic fault line, and extensive deforestation has left the country vulnerable to landslides and flooding. Add in a lack of infrastructure and government funds, and the challenge of providing reliable, quality and accessible medical care in Haiti can seem overwhelming. Originally from Haiti’s capital, Port‐au‐Prince, Dr Laborde’s medical career has been driven by an acute sense of duty to serve those who are less fortunate. His efforts to provide medical care to Haitians began in earnest in the wake of the devastating 7.0 magnitude earthquake in 2010, which left an estimated 250,000 people dead, 300,000 injured and more than 1.5 million homeless. 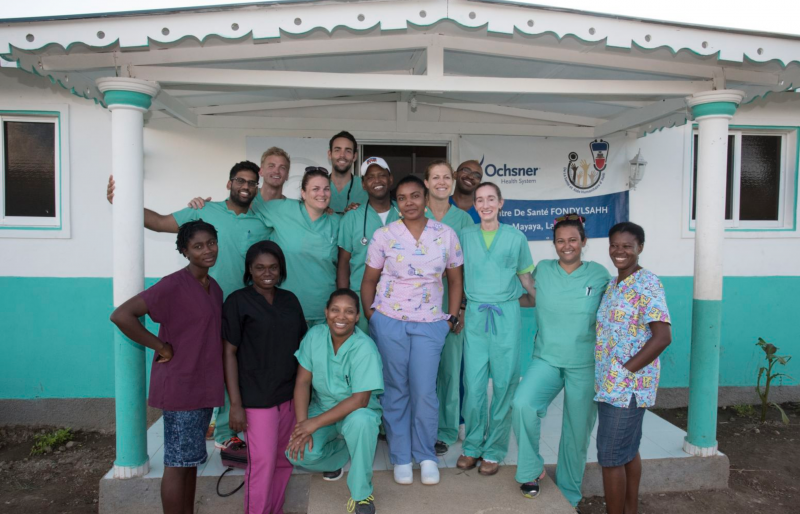 Dr Laborde led Ochsner Health’s initial relief effort on the ground in Haiti and afterwards sought out a way to continue the work long‐term. “I thought coupling our academic mission to our humanitarian work in Haiti would be an excellent way to create a relationship that could be mutually beneficial,” Dr Laborde recalls. In the eight years since, Dr Laborde’s efforts have evolved into a dedicated program that sees six to eight medical students participating in an annual eight‐week rotation involving extensive preparation and training. This is followed by an intensive two‐week clinical experience. The students are based at self‐sustained medical clinics in regional towns, supervised by board certified physicians and local staff seeing up to 100 patients a day – in stark contrast to the 15–20 patient average in an American clinical setting. The goal is to provide safe, high quality and culturally sensitive care in a challenging and resource‐poor setting. “The program provides great benefit to Ochsner students by giving them invaluable clinical experience while really making a difference in the lives of people who are in great need. The philosophy behind this innovative program is a shared desire to improve access to healthcare for all. “We fundamentally believe in Article 25 of the United Nations Declaration of Human Rights, which states that health care and access to care is a basic human right,” Dr Laborde explains. “We want to establish long‐term, sustainable relationships with a focus on education, access to water, nutrition, children and women’s rights. “The clinics are one of the most personally and professionally satisfying aspects of my life and career. To read more or donate, visit www.labordefoundation.com. This story is featured in the Summer 2018 edition of UQMedicine Magazine. View the latest edition here. Or to listen, watch, or read more stories from UQ’s Faculty of Medicine visit our blog, MayneStream.